I have moved. Here is my new home, in case you are not automatically redirected. Aloha !! 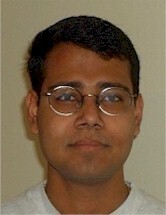 My name is Sagar Chaki and I am currently doing my Ph.D. at the Department of Computer Science at Carnegie Mellon University . My department is part of the School of Computer Science (SCS) . My advisor is Prof. Edmund Clarke . I am a member of the Model Checking Group at CMU. I did my B. Tech. from the Department of Computer Science and Engineering at the Indian Institute of Technology, Kharagpur . Here is my resume in Postscript, PDF, Microsoft Word, Text and HTML formats. This page will be frequently updated. So drop by for cool stuff ! !